Originally posted on Whats On Fraser Coast Issue 9-Sept 2017. Hello, my name is Peter Rowe, I am an Author, Artist and Presenter, and yes, I just happen to have Down syndrome. I was born with Down syndrome and other conditions that limit my verbal ability, although I have never felt limited nor defined by this. I may not have been blessed with the gift of speech, I was however born with a passion to communicate. I was introduced to ‘Facilitated Communication’ in my early thirties and it has changed my life. With the assistance of a facilitator I tap out my words, letter by letter onto a “QWERTY’ board, with my facilitator speaking them as I tap. Facilitated Communication was the beginning of me finding my voice and sharing my story. I was finally free to share my thoughts, my hopes, my fears. With the support and love of my Mum and Dad I began to show everyone that I was more than a label. Art has been an important part of my journey, it has given me a way to share my voice, my story and a way to connect, with my words and stories embedded within every piece I create. Art began as a form of therapy for me to overcome trauma from abuse I experienced in a care facility many years ago. Creativity allowed me to paint through the darkness and the pain, into a place of peace, happiness and colour. Today because of the support of wonderful people in my life and within my community like Cheryl Nonmus my art tutor, who believe in who I am and all I am capable of I have grown as an artist and as a person. I am living a life I love, I can finally express who I am and what I stand for. I am passionate about the importance of community connections because I believe when people feel connected to, and part of their communities, they are more likely to feel valued and less likely to feel isolated. I get great joy from encouraging people regardless of abilities to do whatever it takes to find their voice and share their story. Something that makes me even happier is when I see individuals and communities doing their bit to ensure this happens. Last year at the opening of my ‘Take a Seat’ exhibition at Gympie Regional Gallery, I had the pleasure of meeting a creative, colorful and intuitive young lady from the Fraser Coast, Leigh West. 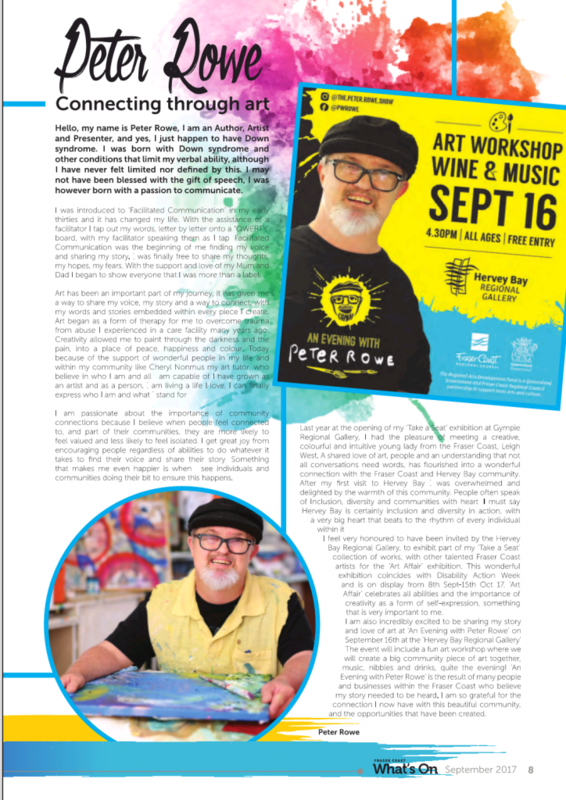 A shared love of art, people and an understanding that not all conversations need words, has flourished into a wonderful connection with the Fraser Coast and Hervey Bay community. After my first visit to Hervey Bay I was overwhelmed and delighted by the warmth of this community. People often speak of Inclusion, diversity and communities with heart. I must say Hervey Bay is certainly inclusion and diversity in action, with a very big heart that beats to the rhythm of every individual within it. I feel very honored to have been invited by the Hervey Bay Regional Gallery, to exhibit part of my ‘Take a Seat’ collection of works, with other talented Fraser Coast artists for the ‘Art Affair’ exhibition. This wonderful exhibition coincides with Disability Action Week and is on display from 8th Sept-15th Oct 17. ‘Art Affair’ celebrates all abilities and the importance of creativity as a form of self-expression, something that is very important to me. 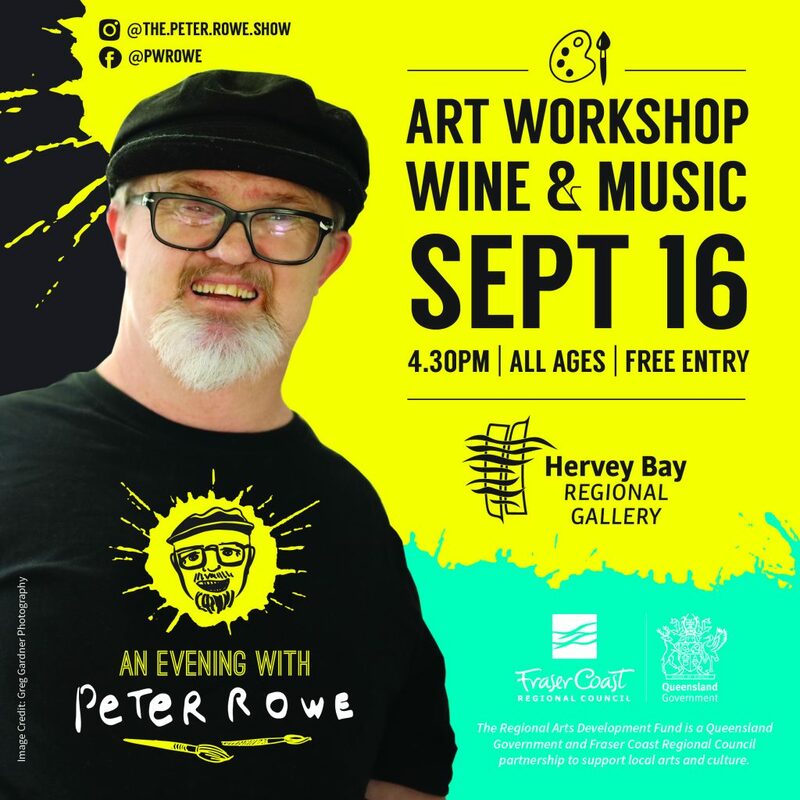 I am also incredibly excited to be sharing my story and love of art at ‘An Evening with Peter Rowe’ on September 16th at the ‘Hervey Bay Regional Gallery’ The event will include a fun art workshop where we will create a big community piece of art together, music, nibbles and drinks, quite the evening! ‘An Evening with Peter Rowe’ is the result of many people and businesses within the Fraser Coast who believe my story needed to be heard. I am so grateful for the connection I now have with this beautiful community, and the opportunities that have been created.